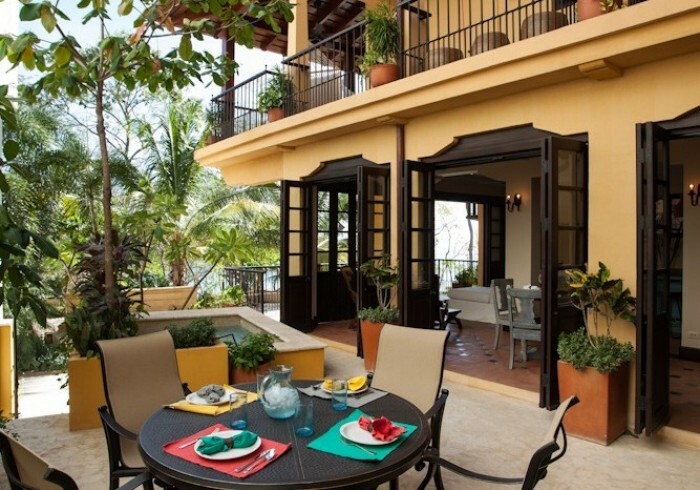 Casa Cielo is a three-bedroom, three-and-a-half-bathroom house located in the heart of Beach Town at Las Catalinas and is perfect for a family or group of friends. The entry way leads you into a garden courtyard featuring a tasteful fountain, cozy private plunge pool, outdoor dining table for six, and enchanting balcony with ocean views. The cleverly designed room floor plan of the main living area includes a fully equipped kitchen, indoor dining table, and comfortably furnished living space, accented by earth-toned floor tiles and dark wood finishes. On the first floor, you will also find one of the guest bedrooms featuring a queen bed, as well as a small storage room with a washer/dryer for your convenience. On the second level, you will find another guest bedroom with two single beds that can be arranged as a king bed upon request. Enjoy a hassle-free stay in the large master bedroom offering a walk-in closet and a bathroom with a special indoor-outdoor shower feature, in addition to direct access to a wraparound balcony with mesmerizing oceans views.